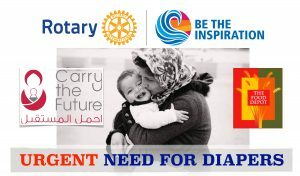 Rotarians are launching their 3rd annual Bring One/Send One campaign for diapers. Please donate $10 to buy diapers and baby supplies for refugee camps AND/OR bring diapers to two drop-off locations. The $10 contribution will be for immediate use by Carry the Future (CTF) volunteers throughout camps in Greece, Serbia, France, Jordan, Bangladesh and to any refugee or asylum seeker globally. Diapers will be distributed to Northern New Mexico families in need by The Food Depot, our local diaper bank. Any diaper brand and size are appreciated, though sizes 5 & 6 are most needed. *One FREE child admission for every $10.00 contribution to CTF; must be used same day.